Do you miss the simpler life? Do you ever wish life was more like Mayberry with Barney, Andy, and Opie enjoying a lazy day down by the pond fishing, laughing, and having fun with their friends? 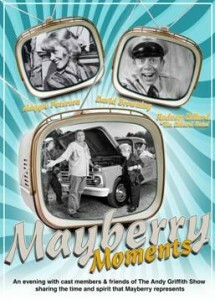 If you are a fan of the Andy Griffith Show you will not want to miss the opportunity to have an Evening in Mayberry with your friends The Mayberry Deputy, musical memories from members of “The Darling Family”, and enjoy the experience of characters from the town ofMayberryand days gone by in a family friendly atmosphere. In 1962, THE DILLARDS, who had a new recording contract with Elektra Records, were asked by the producers of The Andy Griffith Show to play a bluegrass-playing family (The Darlings), whose patriarch was to played by popular Hollywood actor Denver Pyle… and to this day THE DILLARDS are seen nearly every day somewhere in the world thanks to the still enormous popularity of The Andy Griffith Show re-runs. And last but certainly not least, visit with Maggie Patterson who played Charlene Darling on The Andy Griffith Show. This event is perfect for Mayberry Days events, Andy Griffith Fan Clubs, County Fairs, Private and Corporate Parties, and anywhere you just want to have fun and remember when life was more relaxed and good moral values prevailed.